Frankist leader; lived in Galicia in the eighteenth century. He filled the office of rabbi at Nadworna, Galicia, but joined the Frankist movement as soon as it arose and became the leader of the sect. 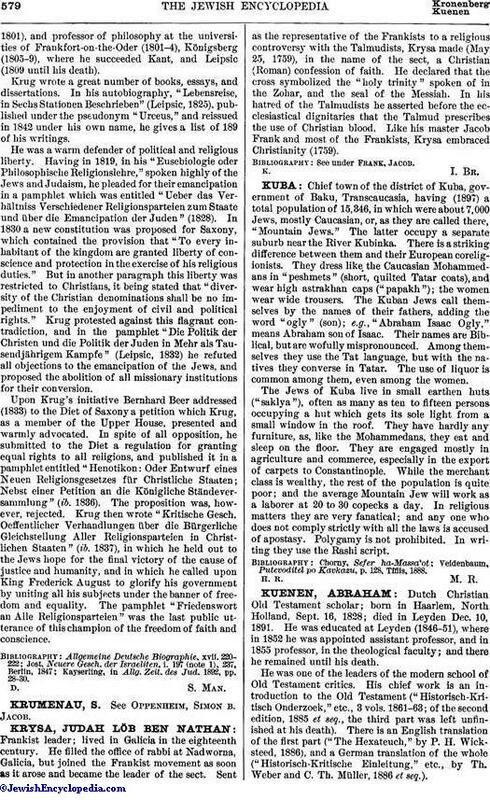 Sent as the representative of the Frankists to a religious controversy with the Talmudists, Krysa made (May 25, 1759), in the name of the sect, a Christian (Roman) confession of faith. He declared that the cross symbolized the "holy trinity" spoken of in the Zohar, and the seal of the Messiah. In his hatred of the Talmudists he asserted before the ecclesiastical dignitaries that the Talmud prescribes the use of Christian blood. Like his master Jacob Frank and most of the Frankists, Krysa embraced Christianity (1759).